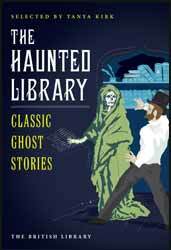 In the same format as the excellent Lost in a Pyramid & Other Classic Mummy Stories, comes The Haunted Library: Classic Ghost Stories. It is a 234 page paperback containing twelve short stories from the years between 1910 and 1963, selected by Tanya Kirk – Lead Curator of Printed Heritage Collections at the British Library, the publisher of this book. The cover illustration is by Rawshock Design. Although this is an eclectic mix, the more accomplished names stick out as being more unusual but smoother stories, both structurally and with a refined writing style. Algernon Blackwood is one of the closest to the modern format, and M.R. James…well, M.R. James is quite simply the best ghost story writer of all time – so no collection would be complete without him. Conversely, E.G. Swain, who was present at James’ famous Christmas ghost stories when Dean at Cambridge, doesn’t have the same flair and is rather predictable in the tale given here. There are a few authors represented here that the world has forgotten about; the real pleasant surprise is Mary Webb’s Mr Tallent’s Ghost. It is described as a pastiche, but has a sensible twist and a good amount of sarcastic humour, which was unusual for the time. Everyone has their favourites and everyone enjoys different writing styles, but I’m happy to report that I enjoyed immensely the reading of every story chosen for this book. If you like the formal prose of the late nineteenth and early twentieth centuries this will definitely be for you. However, the book cleverly brings in more comfortable examples, although I would question the order of the tales because Afterward is probably the weakest of the bunch and so a strange choice to open with. Another great collection of dark tales from the British Library. I eagerly await more. Highly recommended.